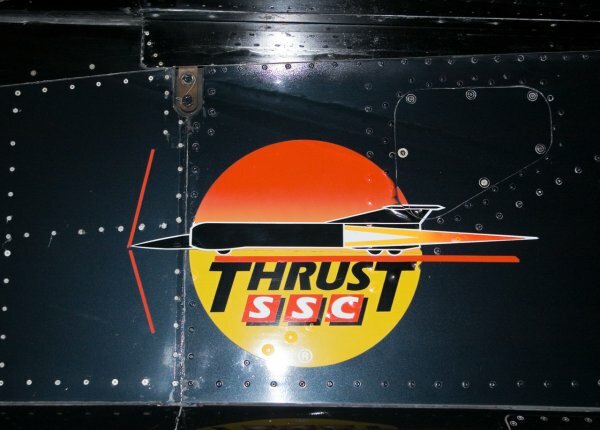 Thrust SSC - My parts from its history. 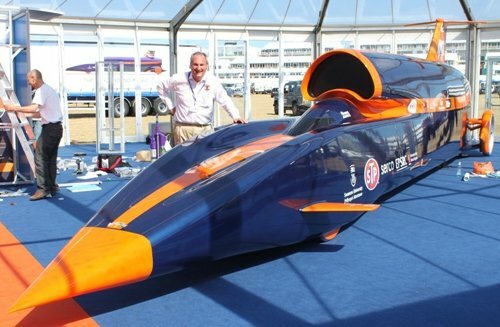 I live just a couple of miles from the RAE at Farnborough, where Richard Noble's SSC team are based. 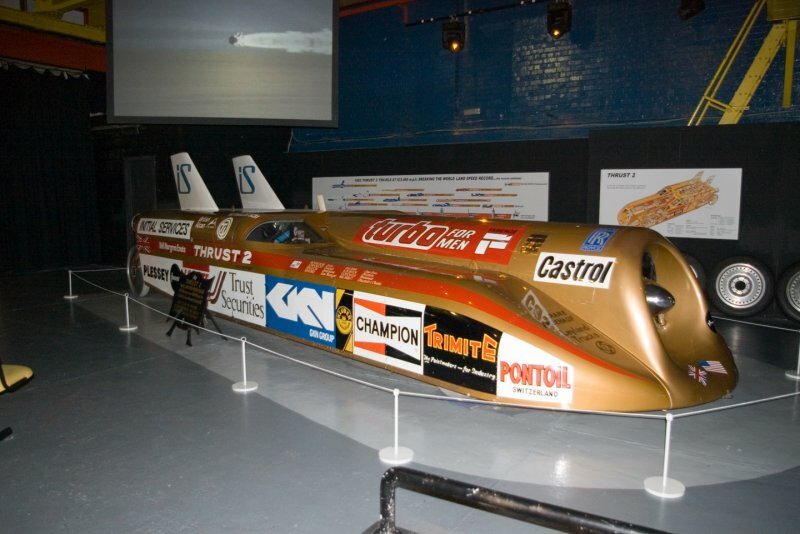 They successfully broke the LSR and the sound barrier on 15th October 1997 by Andy Green in ThrustSSC, on the Black Rock Desert, Nevada. 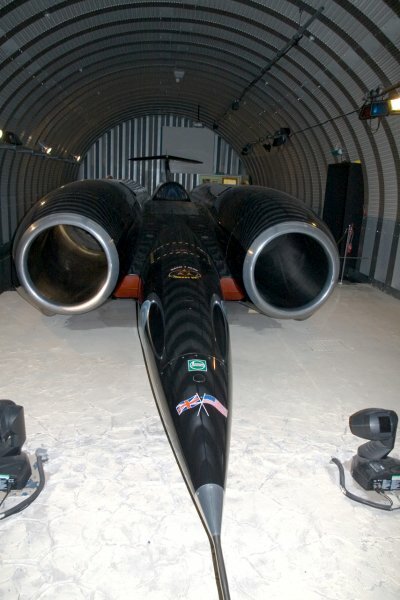 The speed of sound was exceeded on land by Andy Green and ThrustSSC at 763.035mph averaged over 2 1 mile flying runs within 1 hour of each other, as decreed in the FIA rules for setting LSRs. On the 29th November 1997, I was driving past the RAE and saw that the team were auctioning off spares and other items from the project to help pay off their debts. 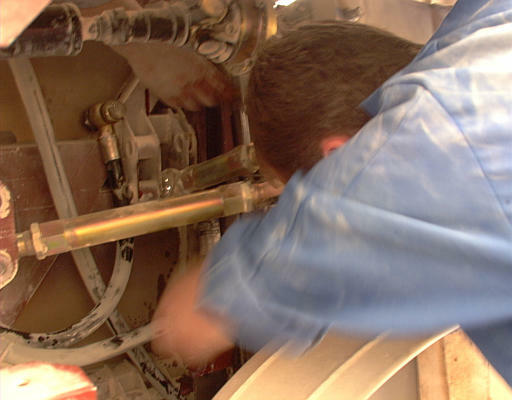 I popped in and after a couple of hours, I became the proud possessor of two suspension tie rods, a 2 metre piece of fuel pipe and a box containing 'Sundry Items from the Hydraulic system'. 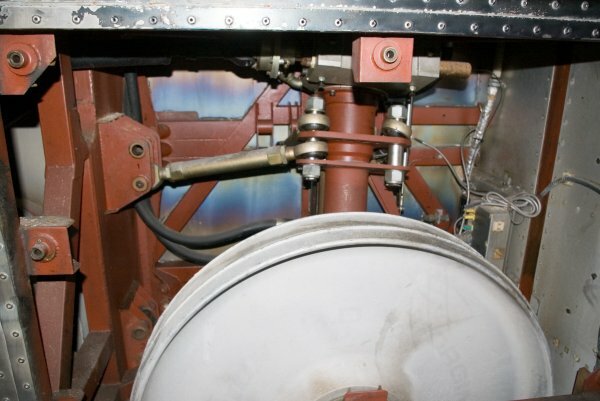 Above: Two shots showing Thrust SSC's rear suspension and many of the components that I acquired at the auction. 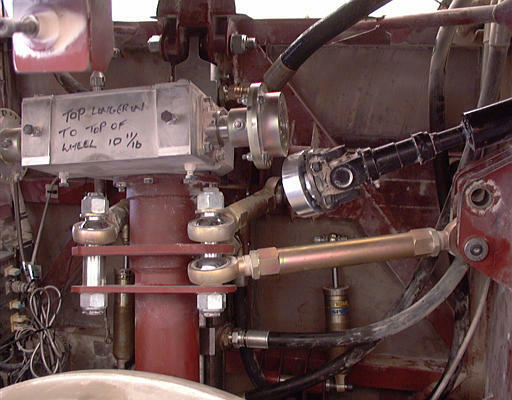 This latter proved a great buy at �, as it included 3 accumulators for the active suspension (sold for around �-50 as single lots), two interesting looking pieces of equipment from Moog instruments, a number of pieces of Aeroquip hosing (most obviously used at some time and identifiable as part of the rear suspension hydraulic system from photos on the SSC web page), some cables and a number of valves and filters. 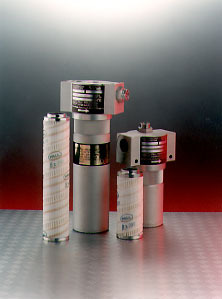 Above: The Hydraulic filters from Pall Filtration. What was particularly good was that most of this stuff was obviously used, rather than simply spare. A number of the items had a covering of sand, suggesting they'd been used in the runs in the Jordanian desert, prior to the visit to Black Rock (Hardly anything from Black Rock was auctioned, except the nose pitot). See and hear a Thrust SSC 750 mph run! Thrust SSC was a great achievement in terms of human ingenuity, engineering and sheer determination to get the job finished and even my eclectic collection of bits gives a sense of holding onto some small pieces of history. I went up to Coventry for a few days on business recently and couldn't pass up on the chance to stop in and check out the Coventry Transport Museum. The museum has lots of Coventry related cars (and bikes and commercial vehicles), but the main draw for me was the presence of the two Thrust LSR cars. The museum presents the cars well. Firstly you go into an area where Thrust 2 sits, with a film running explaing the car's exploits. You then move into a second area where you watch a film on Thrust SSC's sound barrier breaking record programme. Then you can chose (for a � entry to the rest of the museum is free) to sit in a simulator to experience the first run of the LSR record from inside the cockpit (The moment where the car slews sideways at 600+ mph is pretty entertaining). 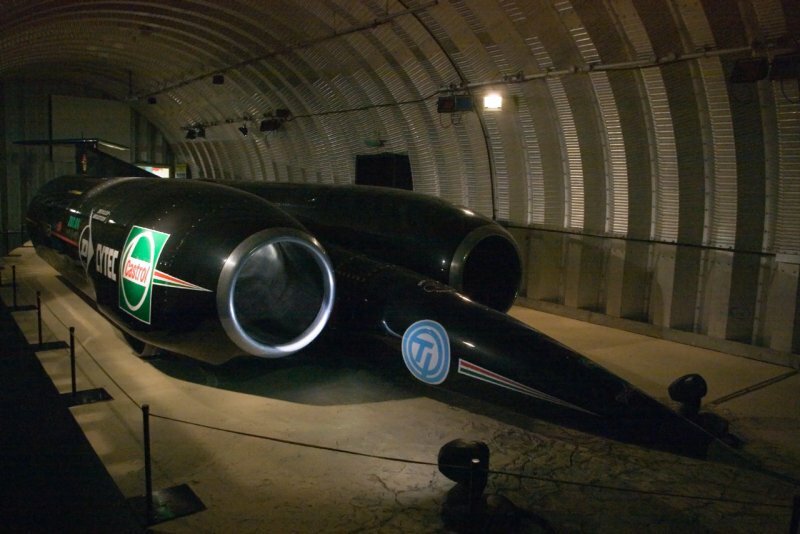 Once out, a film runs of the second run (along with the sonic boom) and then the screen lifts to reveal Thrust SSC sitting in its Nissen hut. SSC is pretty gloomily lit, so my photos aren't great (I didn't take a tripod), but the cars look great and, if you're near Coventry, I'd recommend a visit to the museum. And now the team are aiming to push the LSR even higher. The target is 1000 MPH (Around 1500 KPH) and the project is called Bloodhound. Still very much in the early stages of a multi-year project, you can follow progress on their official website.